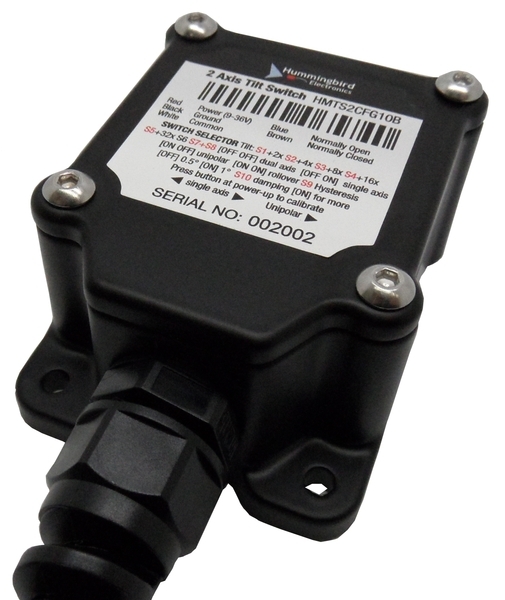 Hummingbird Electronics’ two-axis tilt switch is a simple to configure, flexible tilt switch with a wide range of applications. The tilt-switch can be operated horizontally, vertically or upside down and can be configured for single or dual axis operation. The switch set-point is user configurable. Hummingbird Electronics’ tilt-switches measure pitch and roll angles with high accuracy by measuring the earth’s gravitational field with a three axis accelerometer. A dip-switch provided allows the user to select horizontal or vertical operation and allows single or dual axis operation. Once mounted, the tilt-switch can be opened and calibrated by pressing a push-button switch internal to the device. This will compensate for smallangle offsets due to mounting. The unit should be calibrated at least once if it is to be used upside down. The damping factor (how much averaging is performed) can be changed between two values for fast operation and noise immune operation. A hysteresis value can be set to be either 0.5 degrees or 1 degree. With a set-point of 10 degrees and 1 degree hysteresis, the relay will switch on at 10 degrees and off at 9 degrees. Hysteresis prevents the internal relay from continuously switching on and off at the switch-point. The activation angle can be set between 1 and 64 degrees using the internal dip-switch. A relay with contacts rated at 10A will switch on when the angle set-point is exceeded. Voltage free Normally-Open, Normally-Closed and Common contacts are provided. An internal bi-colour LED is normally green and changes to red when the relay is activated. 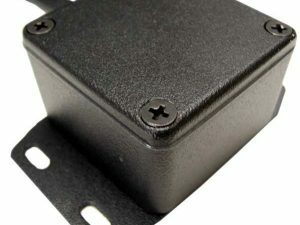 The configurable tilt-switches are supplied in a rugged aluminium enclosure that is splash-proof. Provision for screw mounting when required is provided. Power to the unit and outputs are provided through colour coded wires. Please note that the integrated relay outputs are not internally fused. Driving currents larger than those specified will result in damage to the tilt-switch. SW 9 sets hysteresis 0.5 or 1 degree; off 1 degree, on 0.5 deg.